Frida Kahlo is politically and culturally engaged. She makes her art during a period of cultural blossoming in Mexico. Incorporating pre-Colombian sculpture, jewellery and symbolism into her visual vocabulary, she contributes to the renewal of Mexico’s national identity. 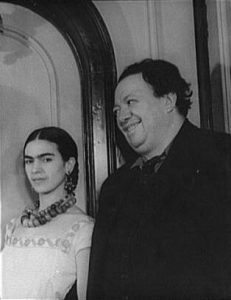 Kahlo’s interest in native Mexican art and culture is closely tied to the creative explosion that happened in Mexico in the 1920s after hundreds of years of oppression against the population. The intensive creativity and innovation that is also known as the Mexican Renaissance was an offshoot of the Mexican Revolution. The artists dreamt of getting back to the country’s cultural roots and rebuilding national pride: Viva Mexico! Accordingly, Mexican artists often included common everyday situations, ce lebrations, peasants, children, cacti and Mexican fruits in their pictures. The exhibition shows Kahlo’s place on the Mexican art scene through a number of works by other Mexican artists.